Darrell Fisherbaugh has four of UH's six saves this season. Darrell Fisherbaugh is an outgoing man who laughs and smiles easily. He comes across as a person who enjoys life with few concerns. He is adept at letting negative encounters roll off his back. When: Today, 6:36 p.m.; Tomorrow and Sunday, 1:05 p.m.
TV: Sunday only, live, KFVE, Channel 5. Radio: All games, live, KKEA, 1420-AM. Tickets: $7 orange and blue sections; $6 red section; $5 seniors, and $3 students ages 4-18, UH students in the red section. 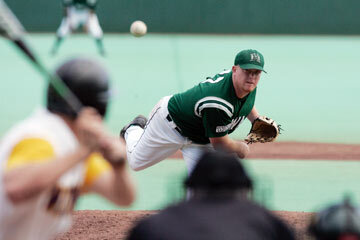 Notes: The Rainbows and Bulldogs have played 24 games with UH leading the series 13-11. "I'm my parents times 10. Everyone says my parents (Debra and Daniel) are fun people to be with," Fisherbaugh said. The junior right-hander also gets pleasure out of finishing off what his teammates have started. He is the closer for the Hawaii Rainbow baseball team, a role that requires a different persona, a different mentality. It is a role he has held since his freshman year, despite an inauspicious first outing. "You need to have no fear when you come in with guys at second and third with one out or no outs. You can't be intimidated. You have to be the intimidator at all times," Fisherbaugh said. "The closing role is not just to throw strikes, but to get people out in a hurry." His first appearance as a Rainbow came in the second game of the 2004 season-opening series against No. 5 Texas. The Longhorns had taken a one-run lead and had two men on base in the 11th inning after the 'Bows had rallied twice to tie the score. The first batter Fisherbaugh faced was Drew Stubbs, who went on to be the Big 12 Conference freshman of the year. "The fourth pitch I threw was a (three-run) home run. I got the next two outs and he (coach Mike Trapasso) brought me back the next day. That brought my confidence back a lot," Fisherbaugh said. The experience also reinforced his thinking about handling a negative situation. "That night I didn't know what to do with myself. I was in the dumps. But I realized you can't dwell on it. The next pitch and the next game is completely different," Fisherbaugh said. He was not heavily recruited out of San Marin High School in Novato, Calif. The Fisherbaugh family vacationed on Maui many times and his grandmother used to live in Hawaii. When the UH coaches offered him a scholarship, that made the decision easy. Just what his role with the Rainbows would be was a question mark. He had been a closer and starter in high school. "Darrell couldn't throw strikes during the fall of his freshman year. We work so much with our pitchers in the fall on fastball command and his fastball is his No. 3 pitch," Trapasso said. Complicating the situation was the fact Fisherbaugh lost the ability to throw the curveball he did in high school. "My fastball was average and I thought about redshirting," Fisherbaugh said. "Then, in the spring I started throwing short innings and that gave me short-relief mentality. My arm angle changed, not from coaching, but just changed, and my changeup, a straight circle change in high school, became like a slider or splitter, whatever you want to call it." Fisherbaugh recorded six saves as a freshman, but also was tagged with four defeats and posted a 5.54 earned-run average. "It was evident in his first game that Darrell had no fear. He has the pitches that get you ground balls and strikeouts," Trapasso said. "His fastball command has improved. Now he is getting a strike on the first pitch most of the time. When he gets ahead, a batter is in trouble." Last year Fisherbaugh was 4-1 with two saves and a sparking 1.45 ERA. This season he is 2-0 with four of UH's six saves and has a 2.19 ERA. In 12 1/3 innings he has walked four, struck out 19 and opponents have managed just a .163 batting average. Fisherbaugh recalls one pro scout talking to him in high school after coming to a game to watch another player. That has changed during his two-plus seasons at UH. "There is more interest and I'm excited. So are my parents, even when it is just a letter from a team," said Fisherbaugh, who starts stretching in the seventh inning if the game situation dictates. "I lived in the dorms for two years, now I'm off campus. It has been the time of my life. I couldn't have asked for a better college experience." Fisherbaugh, who caught some in high school and doubles as a bullpen coach for his summer teams, is the Rainbow who handles that duty when there is a first-pitch ceremony prior to a game. "Dean Turner caught the first one and we lost. So, I'm back there and we have won three straight. It's kind of superstitious," said the man with No. 27 on his back.